KANGAROOS in the Wagga district were given a temporary reprieve by a council standing committee after it voted against commercial culling. The Hume Livestock Health and Pest Authority (LHPA) is hoping to expand the area in which kangaroos can be commercially killed to include land surrounding the city of Wagga. The pest authority had asked Wagga City Council for in- principle support for the expansion when it makes its submission to the NSW Department of Environment, Climate Change and Water. However Greens Councillor Ray Goodlass, the chair of the standing committee, spoke strongly against the concept and got plenty of support when it was put to a vote. Wonderful! Finally a council speaks out on behalf of our maligned national icon. "I'm not in favour of this, I don't see how it is necessary. However accurate a marksman is, I think shooting a kangaroo in the head is inhumane." The simple truth of this is lost on most people. Of course it's not humane! That animal wanted to live just like you and I want to live. Most likely it had family that it loved who were impoverished by its demise. The sad truth is that 30% of kangaroos are left in the field* because if they are not clean headshots they are not accepted by the industry which prides itself on being 'humane'. That means the animals died in agony. Some kangaroos are shot in the face, not in the brain. In those cases they hop away to die in agony of gangrene and starvation, uncounted in the annual kill statistics. Not only is shooting a kangaroo in the head inhumane, the way their joeys are killed is even more inhumane. In-pouch joeys are bashed to death against a truck, decapitated with a knife or stomped to death. The at-foot joeys fare no better and die of starvation, predation, stress or hypothermia. 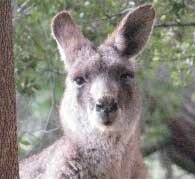 Since 80% of the kangaroos killed are females*, the number of joeys killed each year is estimated at minimum 1 million. How can we keep doing this to such beautiful animals? Deputy Mayor Lindsay Vidler, who argued for the case of the Hume LHPA, said kangaroos were a huge problem for road users in the district. He claimed they were "out of control, causing car accidents." He said he preferred controlled killing to indiscriminate shooting but when it came to a vote, he was on his own in support of commercial culling. And perhaps also Wagga council could encourage residents to appreciate kangaroos? Would farmers be willing to have home-stay programs for international tourists who would love to see kangaroos? According to Sustainable Tourism Cooperative Research Centre (STCRC) 18.3% of our international tourists are attracted to Australia singularly because of its wildlife with 67.5% of all international tourists wanting to see our native animals. A $25.2 billion dollar expenditure by these same travellers equates to between $2.7 billion and $5.5 billion of value from tourism with wildlife, especially kangaroos as the most popular fauna. Since commercial kangaroo industry is valued at only $250 million, this means that kangaroos are worth more alive than dead. Steve McLeod (2004) found that Australian wildlife created more than 14,000 jobs in the tourist industry and estimated that the ‘costs’ associated with kangaroos, such as loss of production, vehicle damage, research etc. amounted to only $76 million. Perhaps kangaroos are the goose that lays the golden egg of tourism to ailing rural economies? 3. Enlist farmers, graziers and landholders to give part of their land as a wildlife corridor so that kangaroos are not forced to graze by the side of the road where they often run in front of cars when frightened. If there were enough wildlife corridors, kangaroos could traverse to other areas safely without having to venture near cars, to the detriment of both themselves and the drivers. Although the standing committee's refusal to endorse Hume LHPA's proposal will no doubt be a blow to the pest authority's submission to the Department of Environment, it is still possible that it will be approved and commercial culling will become a reality in the district. Note: Australian Wildlife Protection Council ( http://www.awpc.org ) has sent a Certificate of Recognition to Wagga Council for their outstanding accomplishment in being the first Australian council in history to stand up for kangaroo protection. Maybe this means the tide against our Australian symbols, kangaroos, is slowly turning? The hatred and fear of our national emblems is completely irrational and simply retro of our Colonial legacy. Fighting against Nature, against Darwin's evolutionary "best fit" for survival theories, is contrary to the interest of native animals and our ecology. After 220 years since European settlement, we still do not know how to live in harmony with our environment, or have any empathy for native animals. A greater proportion of native vegetation has been cleared for grazing and cropping from this bioregion than any other in New South Wales. A major challenge for the preservation of biodiversity across the region is to establish and maintain vegetation corridors that will allow gene flow and hence species to adapt to changes in climate. There needs to be intensive programs for wildlife corridors and re-vegetation project to stop the tide of extinctions. Wagga Wagga City Council is working towards improving and restoring habitats for native flora and fauna. Threats to the endangered Squirrel Glider population in Wagga Wagga Local Government Area include further loss of habitat through clearing of regenerating River Red Gums, lack of regeneration of other native plants, inability to recruit individuals, vulnerability to local extinction via stochastic events and predation from red foxes and domestic or feral cats. There is not room for complacency even for "common" species, or justification for the inherent cruelty of commercial kangaroo killings. Well done to the Wagga council! It is more than a decade since I migrated (reluctantly) from the Wagga Wagga region but visits since then have only bolstered my opinion of the Wagga Wagga council as a very progressive and forward thinking example of local Government. As a result I am not surprised at this decision. I am not qualified to comment as to the current abundance of roos in the region at present but in the years that I lived there I saw no evidence whatsoever of plagues nor significant pest status where kangaroos were responsible. Other Local governments would do well to look towards Wagga Wagga not just on environmental issues but on other areas of local government fuction also. I don’t support commercial culling, but I do not agree that headshots are inhumane. For me the issue is not how culling is undertaking but rather should it be undertaken is it necessary in a particular area? Shooting Roos to reduce Roadkill is nonsense. Drivers need to accept the various hazards, take some personal responsibility and drive according to conditions whether those conditions be wildlife, poor road design or maintenance, adverse weather, lighting etc. I regard roadkill as just another check to wildlife populations, more abundant populations will see an increase in roadkill. Drivers need to use common sense. Risk of collision is not a valid reason to support or introduce commercial culling.